Alexander Wang continues to fuse his well-known street-style-meets-athletic wear aesthetic into the Balenciaga DNA. 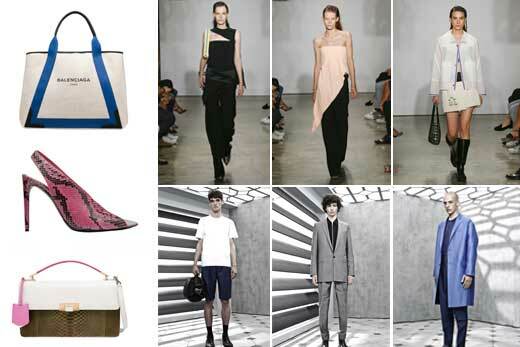 The Balenciaga Resort 2015 collection advances a minimalist outlook that favours a combination of summer staples, like bandeau tops, with masculine statement pieces, like seamless blazers. Wang’s reference point this time around was sailboats, which would explain the clean lines and folded drape of his leathery tunic dresses and skirts. The collection’s utilitarian outerwear was influenced by the sturdy shape of foul-weather gear. You could sense Wang’s urban emphasis and fabric-innovation focus on these collections. Wang turned his hand to more rugged outerwear, too, and one fantastic cocoon bomber jacket in satin and silk jacquard with an oversize net motif spoke to the codes of the house in a modern way. His mission was to find a harmonious asymmetry in transitional dressing, and handkerchief hemlines fluttered down the backs of urban staples like superlight crepe blouses and wide-leg pants twisted with satin across the waist. Previous articleSAINT LAURENT Rock On!